Low maintenance: The absorption force at the filter decreases gradually over time as the absorber is used. When the filter surface becomes completely white, the filter should be replaced. Vertically mounted: Can absorb widespread fumes. 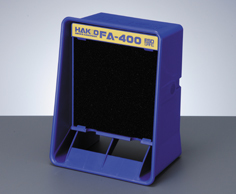 Using a stand: When there is insufficient space or to absorb smoke from upper areas. Horizontally mounted: Powerful absorption at closer area with high flow rate. Because of low height, it gives less shade keeping your working area light.